Serving the community of Southeast Baltimore County in Maryland, Living with Grace (LWG) was established in 2009 by two long time Dundalk female residents who recognized the need to help senior women that are delaying essential medical supplies because of fixed income limitations. The mission then evolved into assisting qualified senior women relocate to the senior housing. Please visit our Donation page. We are grateful for your financial support to make this vision a success for the senior women. To ensure that the senior woman of southeastern Baltimore County living in Dundalk (ZIP Code 21222) Edgemere (ZIP Code 21219) or Fort Howard (Zip Code 21052) living on fixed income have an avenue for assistance in achieving a healthier quality of life. To provide a one time financial grant (maximum $500.00) to help meet the essential medical needs beyond the covered benefits of Medicaid and Medicare. To provide a one time financial grant (maximum $500.00) to assist in the relocation to a senior housing facility located in the community. On October 27, 2016, Nicole Rodman wrote about the plight of senior women during the recession and the need for their support. 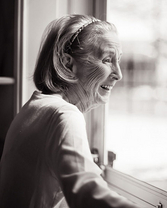 She exemplifies Living With Grace as an organization that supports senior women. Thanks you Dundalk Eagle for your support. Living with Grace was started in Nov 2009 and is a registered DBA under EIN #52-1242293 a designated 501(c)(3) IRS non profit. The Fund does not discriminate on the basis of race, faith, color, sexual orientation, national or ethnic origin.